In the past two seasons, one team in particular that the No. 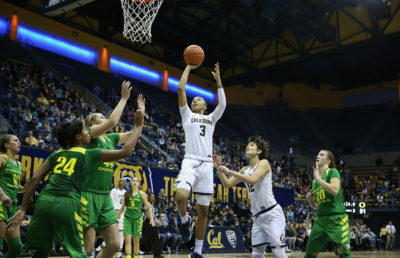 23 Cal women’s basketball team has struggled against has been No. 25 Arizona State. 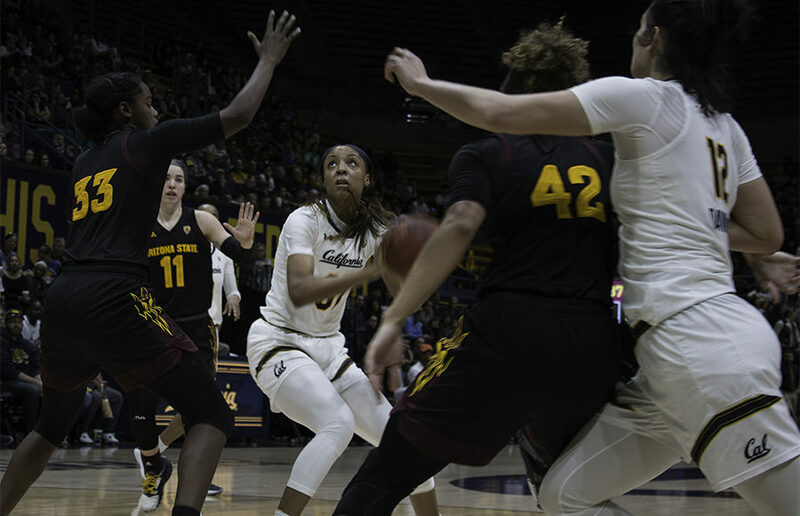 For the Bears, this contest was no different, as Cal dug itself into too big of a hole early on and was never able to get things going, falling 57-42 at home. The Sun Devils (15-7, 6-4) have proved to be a difficult opponent, sweeping the last two season series against the Bears (15-6, 6-4). In the team’s first meeting in early January, Cal struggled in an 80-71 loss. On Sunday, the Bears struggled immensely on the offensive side. Cal ended the game shooting 28.3 percent from the floor, including a dismal 2 of 19 from deep. This poor shooting efficiency was echoed by the fact that the team only managed to score 6 points in both the first and third quarters. The trio of senior guard Mikayla Cowling, junior Asha Thomas and freshman Kianna Smith were 4 of 27 from the field in what turned out to be a game to forget. 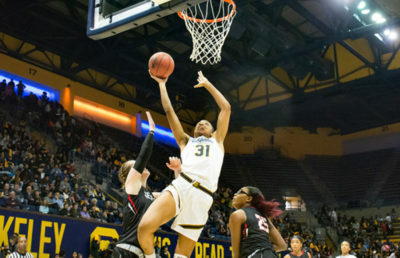 For Cal, the only player who seemed to have any success was junior forward Kristine Anigwe, who had 15 points on 5 of 11 shooting. This doesn’t come as a surprise, but despite her relatively hot hand at times, Anigwe didn’t get very many touches in the paint. Both teams came into this top-25 clash on much different notes. The Bears were coming off a rout of Arizona on Friday in what was one of the team’s most complete performances. As winners in five of its last six affairs, Cal finally looked like a team that was coming together nicely. On the other hand, the Sun Devils were coming off one of their worst games of the season, dropping a road contest to Stanford, 74-50. Arizona State had lost four of its previous six games and was in desperate need of a quality road win. From the beginning, it was clear that the Sun Devils were out to get back to the play that characterized the beginning of their Pac-12 season. They came out with an extraordinary amount of energy and quickly jumped out to a 14-0 lead. Arizona State’s ability to knock down shots coupled with their tenacious press and zone defense completely stymied Cal’s offense. 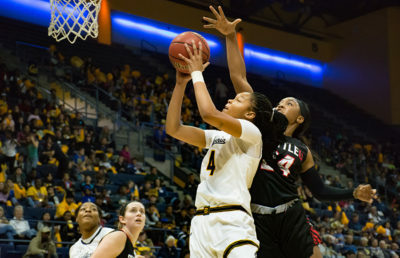 The Bears were not able to buy a bucket until sophomore guard Jaelyn Brown was able to connect on a difficult fadeaway jump shot at the 2:39 mark. In the second period, Cal began to show more signs of life and was able to cut the deficit down to 7 points with three minutes to go in the quarter. Arizona State, however, quickly recovered with two baskets by junior forward Kianna Ibis to stretch the lead to 33-22 by halftime. Heading into the second half, Cal needed to make a more concerted effort to take care of the ball after conceding 10 turnovers. Additionally, Cal needed to find a more effective way to slow down Ibis, who had previously torched the Bears for 26 points in their first matchup. Lastly, Cal needed to start making some buckets as they shot 32 percent from the field, including 1 of 11 from deep in the first half. The problems that plagued Cal in the first half, however, continued to haunt the team in the second. Every time it looked like Cal might be making a little run, Arizona State quickly countered with a run of its own. In the end, Arizona State simply wanted this game more badly than Cal. The Bears were sloppy and never showed the type of fight that they needed against a team that has had their number in the past. Cal will need to put this loss behind it quickly and attempt to regroup. With some of their hardest games still to come against the top teams in the conference, the Bears will need to figure out a way to play more consistently from game to game.